The Spinning Cone Column is a technology that offers promising possibilities to the wine, beer and drinks industries and Vintech Pacific is at the forefront of research into spinning cone applications in New Zealand. Traditional distillation techniques use heat to evaporate and capture volatile compounds such as alcohol. For example, Cognac, Armagnac and other brandies are all made by the distillation of wines. But with traditional distillation the beverage is entirely changed and is no longer practically or legally wine. 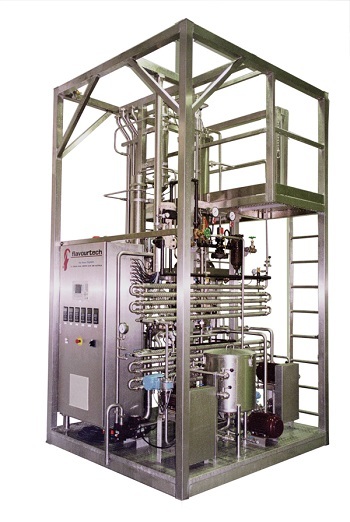 With the Spinning Cone Column, the objective is to retain the original nature and quality of the beverage, whether it be wine, beer, coffee, tea, fruit juice or dairy, yet to adjust some aspect of its character. This may be by capturing certain aromatic compounds and reintroducing them at a later stage of production or perhaps by adjusting alcoholic content in the case of wine or beer. To accomplish this, spinning cone technology varies from traditional distillation in several ways which mean this technique is vastly more gentle on beverages than traditional distillation. Firstly, the temperatures employed are much, much lower; scarcely more than room temperature. Wine for example, will not experience a temperature of much more than about 30° Celsius and even then, only for around 25 seconds as it passes through the column. Because the boiling point of a liquid is directly pressure dependent, this is made possible by applying a vacuum. 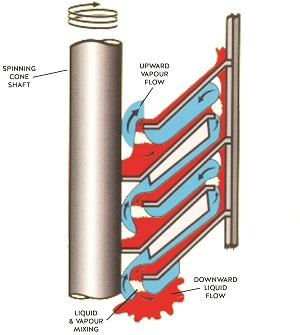 Secondly, the series of spinning cones within the column work to physically spread the liquid into a thin film, further increasing efficiency. Spinning cone column technology is so gentle that juice under fermentation can be passed through the column so that targeted aromatic compounds can be captured and reintroduced into the finished wine. The juice can be immediately returned to tank to complete its fermentation, without harm to the wine or yeast. When used to lower the alcoholic content of wines, no other system to physically remove alcohol offers so many benefits; eliminating damage and preserving aromas, flavours, balance and texture. And spinning Cone is a permitted method for alcohol adjustment in both the United States and European markets. Furthermore, only a portion of the wine to be dealcoholized need be processed to achieve lower overall alcoholic content. Similarly, the spinning cone column is a technology of special interest to brewers who value aroma and flavour in their beers. With it, brewers can preserve and protect aroma and flavour compounds that may denature and be lost during later stages of production and then reintroduced to the finished product at packaging. Alcohol can be effectively reduced without harm to the quality of the product. Spinning Cone is an incredible tool for the development of innovative, new drinks and beverages; juices, RTDs and more. Vintech Pacific will be introducing Spinning Cone Column distillation as a service in July 2019. Stay tuned for developments.